What do you wear in bed? According to a national sleep survey, 92% of us sleep in bed wearing some form of clothing. 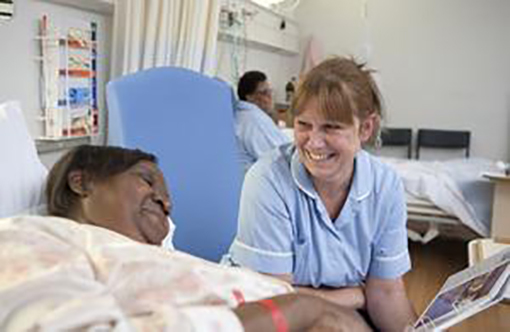 However, caring for patients ‘inbed’, both in health and social care, this figure is more likely to be nearer to 100%. This does not take into account that patients’ skin is not directly in contact with the bed mattress surface. However, a 2009 study in Japan showed there were significant differences between patients with and without clothing in relation to tissue integrity on the coccygeal bone site and the scapular bone site. Leading fabric manufacturers state that for preventative pressure care, stretch fabrics should be used “that will fit the contours of both the device and body giving the required level of support’ and that the “support surface should also have sufficient slip, as excess surface friction can add to the risk of patients developing ulcers”. However, by nature ‘inbed’ clothing is not stretchable, can have surface creasing and can cause ‘hammocking’. Furthermore, the construction and materials used in ‘inbed’ clothing is relatively ‘adhoc’ in nature regarding its ability to slide. ‘Inbed’ clothing also means patients’ skin is not directly next to the support surface as recommended EPUAP Reference Guide DIGITAL NPUAP-EPUAP-PPPIA-Jan2016.pdf which in essence is a contradiction and negates the correct interface when looking at patients and their resting surfaces. So whilst all the above requirements have good intentions, surely ‘inbed’ care management needs to take account of the actual interface between a patient and their bed surface – their ‘inbed’ clothes?